You may remember me telling you about all the kale growing in my parent’s garden. Hubby and I have yet to grow kale, but maybe next year. Why would I when I can nab some of my parent’s, lol?? Because they were overflowing with the stuff and super insistent that I take some (don’t have to tell me twice), I’ve been using kale in allllll the ways. Today I’m bringing you this simple kale salad with apple (the apple comes from hubby and my garden or, er, tree). I thought of other add-ins, but then I realized ‘Dawn, K.I.S.S.’—> keep it simple, stupid and that’s exactly what I did! Then, massage the vinaigrette into the chopped kale and allow it to sit in the fridge, covered, for a bit to allow it to break down slightly when mixed with the vinaigrette. If you want to make this kale salad vegan, simply replace the honey with maple syrup and omit the cheese. Granola as a garnish is highly recommended (I have to thank hubby for this idea). I used buckwheat honey for this honey lemon vinaigrette because it has such a rich ‘molasses-like’ flavour, but feel free to use whatever honey you have on hand, or even maple syrup. If you are making this salad ahead of time, toss the apples with a little lemon juice to minimize oxidation. Hope you love this kale salad with apple as much as I do! This Kale Salad with Apple is made with a few simple ingredients in about 10 minutes. There's hearty kale, crisp apple, pumpkin seeds, cranberries, parmesan and onion all tossed in a buckwheat honey vinaigrette. So good! Place all ingredients for vinaigrette in a small mason jar, cover, and shake to combine. Place kale in a bowl and drizzle vinaigrette over top. Using your hands, rub in the vinaigrette (massage the kale leaves for a minute or so). Toss kale with remainder of salad ingredients. Best covered and placed in the fridge for a couple hours (though, you can enjoy it right away). Cut the kale into bite-sized pieces or ribbons. Nobody want a huge piece of kale. Massage the vinaigrette into the chopped kale and allow it to sit in the fridge, covered, for a bit to allow it to break down slightly when mixed with the vinaigrette. I used buckwheat honey for this honey lemon vinaigrette because it has such a rich 'molasses-like' flavour, but feel free to use whatever honey you have on hand, or even maple syrup. Use whatever apple variety you like or have on hand. Love that you kept this simple Dawn! And with fresh, local ingredients, no need to make it complicated! Apple and kale are a great pair, and that dressing sounds delicious! And I like your hubby’s idea for granola as a topping! Brilliant! Hope you had a great weekend! Thanks Leanne 🙂 Sometimes simple is best! Hope you had a great weekend too! This is beautiful. Love everything about it! Thanks Mimi 🙂 Happy to hear that! Thanks so much Mimi 🙂 Happy to hear that! Totally! Thanks so much, Kathy! It’s the best when parents offload their garden produce, haha! My in-laws gave us a bunch of kale this summer from their garden that I would have loved to use in this salad! I love the granola idea – I never would have thought of that. Cheers, chicka! I am not the world’s biggest raw kale fan, much prefer it cooked…but….looking at this salad..You may have changed my mind. Like the massage tip:) And the vinaigrette rocks! I am a fan of buckwheat honey. Great job on growing those apples! I sure hope so 😉 Thanks Milena! Apples make an excellent addition to fall salads, and I often use them either fresh or slightly caramelized in honey/maple syrup. 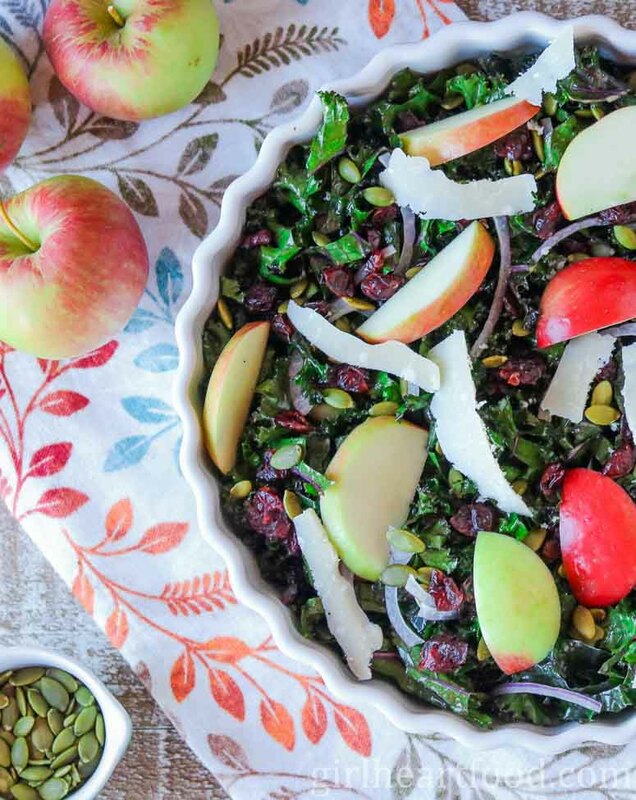 This combo of kale, cranberry, pumpkin seeds, apples, and granola (great idea indeed!) is just perfect. I would have probably added just a bit of crispy bacon too. Very well done! A crisp and crunchy salad with flavors of fall that will be a must try. From prep to table in just minutes, even better! Those are beautiful apples! This seems to be the year I learn about different varieties of honey, they seem to be everywhere, and that’s a good thing :). The granola is a cool idea, kudos to him. I love all the crisp fall ingredients in this salad Dawn! And the dressing if nice and light, just the way I like it. I’ll be adding this one to my fall salad lineup! This looks WONDERFUL! I love kale salads because, even if I load them with ALL the toppings, I feel like I’m being healthy. This vinaigrette sounds soooo good–I’ve never tried buckwheat honey but the molasses flavor intrigues me so I’m going to have to find some. And then make this salad :). Love it! Have a great weekend, Dawn! Such a perfect Fall salad and even better with home grown goodness 🙂 Love the vinaigrette, too! I’m so impressed with the apples you grew, Dawn! Seriously. We have 2 apple trees, and they’re getting big enough (finally) to produce a handful of apples. But the apples just look janky and misshapen…nothing like your perfect apple in that photo! I probably need to go read about how to take care of the trees in the summer growing season so that our apples look better in the Fall. In the meantime, though, this salad. You’ve been killing it with some fun Fall recipes lately! I need to put this one on the menu….and kudos to your husband for the granola idea, too!